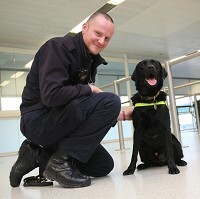 The U.K. has a pack of currency-sniffing dogs who picked up on the scent of £9.9 million (that’s USD $15.2 million!) this past year. The money they’re nosing out is generally related to crime, but we can all wish we could train our dogs to find that $20 we misplaced! This entry was posted on Thursday, December 29th, 2011 at 12:50 PM. It is filed under Blog. You can follow any responses to this entry through the RSS 2.0 feed.